Get ready to rumble, fine citizens of India. You're about to witness the best-built structures since the Taj Majal's debut. September 24-25, Mumbai (Bombay), India, hosts the first IFBB Professional Bodybuilding and Figure contest ever held in the world's second-most-populated nation. Bodybuilding gained major traction within the subcontinent during the past decade, in large part due to Sheru Aangrish, the only professional bodybuilder from India and the visionary of the Sheru Classic. Sheru and his brother Hemant Aangrish successfully launched Double H Nutrition, India's first supplementation company, in 2006. Since 2008, the brothers have established top-of-the-line gyms in Delhi, Noida and Punjab Province, expanding the popularity and reach of one of the fastest-growing sports on earth. With the help of Jim Manion, Chairman of the IFBB Pro League and President of the National Physique Committee of the USA, Sheru was granted approval to bring the industry's top professionals to Asia to compete in the world's third-largest bodybuilding and figure competition. be making their way to Asia this September. Jay Cutler, Phil Heath, Kai Greene, Nicole Wilkins and Erin Stern headline a groundbreaking lineup of stars who will compete for a piece of the $150,000 purse. The Sheru Classic will be held a week after Mr. Olympia, leaving no doubt that revenge will be on the minds of those who were left off the penultimate podium at the Olympia. 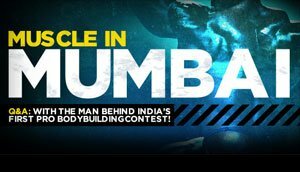 2011 IFBB Arnold Classic Champion Nicole Nagrani and Bodybuilding.com Deputy Editor Kris Gethin will give guest appearances in the action-packed weekend in Mumbai, the "City of Dreams," on India's west coast of the Arabian Sea. Nicole Nagrani at the 2011 Arnold Classic, Ms. International, Fitness International & Figure International. The Sheru Classic is another milestone in a long line of achievements for bodybuilding and figure competitions. The organizers and athletes are truly pioneers, proving once again that there are no limitations to how far the sport can be pushed.